Vivec (also spelled Vivek), or Vehk, Warrior-Poet deity of the Dunmer and "vi" in the Almsivi, is the Guardian God-King of the holy land of Vvardenfell, and ever-vigilant protector from the dark gods of the Red Mountain, the gate to hell. Though some aspects of his past are blurred by time and questions surround some of his more controversial choices, Vivec has always represented the spirit and duality of the Dunmer people, which is reflected in his half-Dunmer, half-Chimer appearance. For hundreds if not thousands of years, he mostly resided at the pinnacle of his Palace in Vivec, his capital, which is visited by hundreds of pilgrims and tourists daily. He honorably guided and protected the Dunmer for thousands of years until his loss of divinity and disappearance near the end of the Third Era, a sacrifice he not only accepted, but helped to bring about. 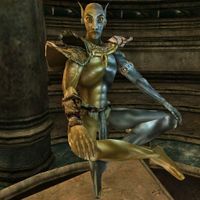 Following his disappearance and the collapse of the Tribunal Temple, he was renamed Saint Vivec by the New Temple and declared a member of the False Tribunal. "The blight is gone, and we have survived. Now we must dedicate ourselves to rebuilding the Temple. And you must dedicate yourself to your responsibilities as Protector of Morrowind." "'Dagoth Ur's Plans' summarizes what we know or suspect. You have a copy. It's also available in my library." Although Vivec has some voice files, they weren't included in the game. They can be found in the Data\sounds\vo\misc directory on the game's installation disc. One was alarm dialogue: "I won't let you do that." Two were dialogue for attacking an enemy: "Foolish mortal." and "Don't fight gods, fool." One line of dialogue was a laugh for when he is hit in combat: "Hahah!" One was a greeting: "Yes, Incarnate. I am Vivec and I can answer all of your questions." One was idle dialogue: "It is lonely to be a god." This page was last modified on 20 January 2019, at 02:07.